After a great weekend visiting the family we are finally on the road again. We had supper on Tuesday evening with Brad's Mum and my oldest son Lee, then back to the RV to prep for leaving Wednesday morning. We awoke at 6:30am, beautified, and then headed off to a local truck stop enroute and met Brad's Mum for breakfast so she could see the new RV. My brother lives on an acreage so Meg wasn't able to see the RV before this as she was on a holiday of her own. By 11:30am we had said our goodbye's and were off down the highway. 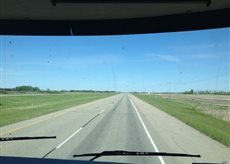 The RV is running great so far (don't jinx it Katie) and I turning my phone into a hotspot I managed to use the laptop to book a camground for the evening just outside Virden, MB. Oak Island Resort is a great spot. We will definitely be stopping here again. Great beach, great staff (though the office was closed when we arrived because I forgot about the time change from SK to MB, but I spoke to a woman on the phone and she told me what spot we were booked into, she gave me 3 site options). We set up (full hookups) our camping chairs, had organic bacon wrapped medallions cooked to perfection by my wonderful husband with a vintage glass of wine in our dollar store plastic glasses. The birds were chirping, we had a mosquito insense stick burning and no mosquitos in sight. The campground appears to be mostly seasonal weekend warriors, there was one truck amongst all the very large 5th wheels with gazebos set up, boats, bbq's. People clearly live here but noone was here except Mr. one truck and he was gone when we woke up at 8am. Hope to make it to Ontario today, Thunder Bay perhaps?! We shall see because I haven't looked to see how far that is and we don't want to push. The biggest part of having this RV is to enjoy the experience, not drive through it. I have pictures on my camera but apparently forgot to bring the upload cord. Hi Dawn, So good to hear from you. My internet is sporadic on this trip but I'm trying to keep up with all our #RVlife peeps.